Thank you for registering for the 19th Annual Novo Nordisk New Jersey Marathon & Half Marathon weekend, which includes the 2015 RRCA New Jersey State Championship race in the marathon distance. In an effort to help make your participation more enjoyable throughout the entire race weekend, this is the seventh in a series of weekly messages containing important information. Copies of these messages will also be available on our Website and on our Blog. Links to them will be posted on both Facebook and Twitter. The Full, Half and Relay races will all start at 7:30 am this year. There are NO Speed Restrictions for athletes in wheelchairs in the full marathon. Mark your calendar for a tune-up training run on Sunday, April 5th (three weeks prior to race day). We will have a 10 miler (8 am start) and 20 miler (7 am start) “Last Long Training Run”, on parts of the courses. Training paces usually run the gamut; anywhere from 7 to 14+ minutes per mile. Our largest groups are 10 min/mile and up. Please “Join” our event on Facebook at: https://www.facebook.com/events/1544864765788444/ We need an accurate headcount to finalize our plans, as we expect hundreds of athletes to run with us that day. Please note: We will start and end these training runs at Indulge Lounge and Food Bar, in Pier Village, at: 16 Laird St, Long Branch, NJ 07740. Parking in Pier Village is free this time of year. For this training run we will not be using directional signs at every turn, but instead we will be providing the route maps as .kml files for you to download and use with your favorite run mapping application. There will be a few directional signs in places where athletes have been confused in the past. As always ,we will provide fluid stations every 4-5 miles with self-serve water and Gatorade. The Finish Area is composed of two secure zones (click here for the map). The first secure zone is the race course; from Pier Village (off the map to the upper right corner), along the Promenade and extending past Rooney’s Oceanfront Restaurant on the upper left of the map. Barricades running the entire length will separate runners, security & medical personnel from spectators, etc. You will only be allowed into this secure area if you have the proper level of security credential. The outermost security zone extends from the course barricades at Madison Ave. to McKinley Ave. (lower right on the map) and then along the side of McKinley Ave. (along the bottom of the map) to Cooper Ave. (in the lower left corner of the map) and from there along Cooper Ave. and then toward the course barricades (in the upper left corner of the map). Please note: Relay athletes who have completed their leg, Volunteers, Vendors and Spectators may gain access to the outermost secure zone via one of the following security checkpoints: Cooper Ave. and McKinley Ave. Everyone passing through these security checkpoints are subject to search and no bags of any kind will be allow past these checkpoints into the outermost security zone. Athletes entering the secure area via the finish line chutes may carry two bags once they have passed through the Athlete Food Area; the Official Race Day Gear Bag from the Gear Drop Trucks located in the parking lot of the Promenade Beach Club, and the food bag given them in the Athlete Food Area as they exit the finish chutes. These are the only two bags which may be carried by an athlete wearing an official 2015 Marathon, Half Marathon or Relay bib worn in plain sight. Spectators may not carry a bag of any kind while in this secure area and will not be allowed inside the finish chutes of the race course. It is the goal of the security plan to provide you with as safe and carefree a finish line experience as possible. The security plan was put in place after the bombings in Boston in 2013. Spectators and athletes who knew and followed the rules are free to enjoy all of the Finish Line Festival activities we offer without interference. That includes standing beside directly behind the barricades along the Finish Area, in designated locations. If you checked a Race Day Gear Bag with us at the Start, pick it up after you exit the Athlete Food tent (on your right), inside the Promenade Beach Club parking area. A changing tent and restrooms will be set up in that area for your convenience as well. If you have a VIP credential, head into Rooney’s Oceanfront Restaurant at any time to enjoy your special post-race VIP location, with helpful staff, food, beverages, etc. created especially for you. Athletes without a VIP credential may also choose to head into the general area at Rooney’s. Why? Rooney’s will be offering discount drinks to athletes wearing their 2015 race bib. To continue into the Finish Line Festival then continue on Cooper and turn left onto McKinley Ave. to access the Finish Line Festival Areas listed below. Signs will be posted along Cooper Ave. and McKinley Ave. to guide you to the various parts of the Finish Line Festival, to the NJ Marathon & Half Marathon bus station for a free shuttle back to Monmouth Park and to NJ Transit’s Long Branch Station for a train home. As you walk down McKinley Ave. you will pass behind the Emergency Medical Service area, which you passed in front of at the finish line. Medical attention is available again here should you need it. The next walkway on the left of McKinley provides access to: the Recovery/Rejuvenation Tent (get a free massage); the Awards and Results Tent (if you don’t have access to a smartphone with a QR Code Reader installed come here for your finish time), Age Group Results (age group awards will be customized and mailed to you in May); ). Also, in this area, and close to the race course, you will find the Official Merchandise Tent, the Information/Lost & Found Tent, the Volunteer Check-in/out Tent, as well as a vendor engraving finisher’s medals (stop by to have your name and official finish time engraved in the space provided on the back of your well-earned medal). You may access the main stage area from either of two walkways on McKinley. There is seating in front of the stage and plenty of green space behind the seating area to enjoy the concert. BTW – we will be announcing the name of the Finish Area Festival band performing on this stage very soon. This stage is also the location of the Awards Ceremonies for the half and full marathons. If you’re planning to meet other athletes and/or your support team after your race, the Reunion Area is the place designed to make that as easy as possible for everyone. It is accessible via either the main stage area or via the walkway on McKinley just beyond the stage. Look for the tall inflatable Windmill gorilla marking the location of the Reunion Area. Continue further along that walkway you will find: Sponsor Village. Our Sponsors hold raffles throughout the festival hours and provide valuable information, exhibits and experts. The next open area on your left as you continue down McKinley will be the food vendor area and also access to Charity Village. The Windmill, Hudson Coffee Co., and other vendors will be offering food and drinks for sale here. The charities in the village are raising money from athletes racing for them during our races and from sponsors and will be celebrating with their fundraising athletes in their village. At the end of McKinley is Madison Ave. Just outside the security checkpoint on Madison Ave. will be portable restrooms for all spectators. If you turn right onto Madison you will notice signs directing you to the free Shuttle Buses back to Monmouth Park. Please note: New Jersey Transit trains WILL NOT STOP at Monmouth Park. Turning left at the intersection of McKinley and Madison Ave. and then turning right a short way down Madison Ave. (toward the ocean) will be signs lead to the Ocean Place Resort and further on to Pier Village (not shown on the Finish Area Map). There will also be signage leading you through Pier Village and to the Long Branch Train Station. Please note: There will also be a band playing at the Tiki Bar at the Resort for your enjoyment, as well as bands at Rooney’s and as several locations in Pier Village. Tell us your story! Why do you run? What it is that got you started and what is it that keeps you going? 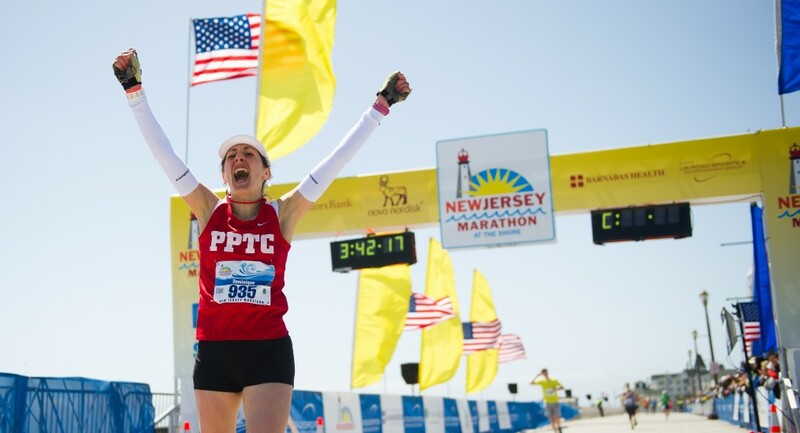 As we do each year, we’re again collecting stories at: info@njmarathon.org. We’re looking to inspire people with your wisdom, stamina and experiences! Please join others in letting your fellow athletes know of the trials and tribulations you’ve overcome and how running has helped. Every year we are amazed by the stories of bravery, persistence and determination in the face of the very significant adversity which our fellow athletes have experienced. Some of us run because we can, but many of us run because we must! Why? How has it helped? Your story may help someone who’s going through what you already have, and here’s a way to reach out to them. Pre-Race: Carpool and be in the parking lots about 75-120 minutes before the race start (7:30 am), or take the Special NJ Marathon Race Day Transportation. Click here to register. Pre-paid parking at Monmouth Park: We strongly suggest the pre-paid option ($5) for these lots. Paying as you leave will cost $10 and will likely slow down your departure. Click here to register. Pre-paid parking near the Finish Area: Guaranteed Parking for spectators at 7-President’s Park is SOLD OUT. Post-Race: Getting home: Take a regularly scheduled NJ Transit train, (Please note: these trains do NOT stop at Monmouth Park), walk to your vehicle in one of the parking lots near the Finish Area, or take one of our free shuttle buses back to your vehicle at Monmouth Park. Race Day Gear Check: Take advantage of this free service for dry, warm clothing after your race! Race Packet Pick-up: Free at the Expo, paid service on race day morning. Click here to register for Will Call Service. Race Day Security Information for Spectators (click the link and scroll down to the “Security Info”). I hope that the information above will help you to understand what to expect at the finish areas, and help you to better plan your time with us at the Shore. This entry was posted in Race Info and tagged Awards, Bags, Charity Village, Engraving, Information, Last Long Training Run, Lost & Found, Merchandise, Ocean Place Resort, Recovery, Rejuvenation, Reunion Area, Sponsor Village, stage, The Finish Chutes and Festival Area, Why You Run. Bookmark the permalink.